When I was young - well, when I was still a young girl, I had these moods. Each one had to be stilled. With clothes. Which I found at factory sales for 5 German marks per kilo. But mostly I was hunting for pretty buttons to completely change the look of a dress, a blouse or a jacket. Already then the idea was born to create my very own button one of these days. It took a bit of time but now I can finally and proudly present to you the very first Katharina Kaesbach button. Although it was not that easy. Nowadays almost everything is on the cheap side, fashion and accessories are made in China, even by famous designers. After a long search I found a small company in Germany which still has the know-how to manufacture first-grade quality on old machines. 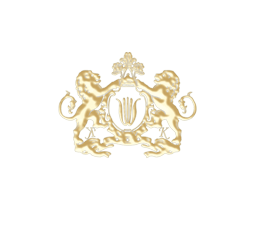 My self-created coat of arms consists of a half-relief cameo embedded in enamel covered by a glass cabochon. Beautiful buttons are a rarity. They compliment my designs and the fabrics I work with. Made in Salzburg, made in Austria. Therefore my customers will deeply appreciate my quest for perfection and quality, being fully aware of the love I attend to each small detail. To make you valued even more. © Katharina Kaesbach GmbH 2019.